All living things on the planet run off of a single substance for fuel called ‘ATP’ or ‘Adenosine Triphosphate’, which comes from sugar/glucose. Likewise every part of every living organism runs off of this substance and this includes the brain. It stands to reason then that if we are low in sugar that the brain should then struggle to run as well. This then is why, after not eating anything for a while, we can find ourselves not only feeling feint and shaky, but also with a searing headache that makes it hard to think and can be very distracting. Simply the brain doesn’t have the energy to function and this is likely to worsen and become very noticeable if the patient suffers from hypoglycemia. 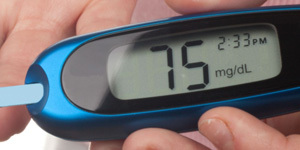 Hypoglycemia describes a point at which the glucose in the body falls below 70mg/dL and this is likely to cause not just dull headaches (which can give way to migraines if you are prone) but also confusion, dizziness, increased heart rate, blurred vision and irritability. Over time these symptoms will worsen leading to numbness, poor concentration, lack of coordination and eventually passing out or coma. This common among diabetic patients who use their insulin incorrectly, as well as people who fast. Other causes are kidney disease, alcohol consumption, problems with the pancreas and endocrine issues. Hypoglycemia can also be more common following intensive exercise when the body will use up all available energy in the blood before moving on to fat stores. Having a post workout energy drink or snack is a good way to avoid this pitfall. The best way to manage hypoglycemic headaches of course is by managing your blood sugar levels and keeping them at a constant level. Little tricks to accomplish this include eating a meal of complex (slow release) carbs to start the day such as cereal oats or a pasta salad. Likewise you should try to eat small meals often rather than just a few big meals spaced out throughout the day. Have some healthy carbohydrate snacks to hand so you can snack on them when you’re at work or on the move. For diabetics this can be a little more complicated. Diabetic patients of course are fighting a constant battle to keep their blood sugar down by injecting insulin and limiting their intake of sugary treats. However it’s important not to take this too far to the point that you end up with hypoglycemia so follow the doctor’s recommendations and use a blood sugar level monitor to keep track of your levels if you struggle. There are many treatments for hypoglycemic headaches and these of course revolve around quickly returning your blood sugar levels to normal. One way you can do this is to eat a fast acting carb such as a hard sweet, some fruit (bananas are particularly good) or an energy drink. Alternatively you can get glucose tablets and supplements over the counter. Eat some of these (but don’t overdo it) and then sleep it off or combat the pain with an analgesic such as paracetamol (better than ibuprofen or aspirin in this case as thinning the blood could worsen the problem). If the headache continues regardless then you should see a doctor.